At Blooms Landcare, we take lawn irrigation and sprinkler systems seriously. Our team of trained professionals has been serving the area since 2006. 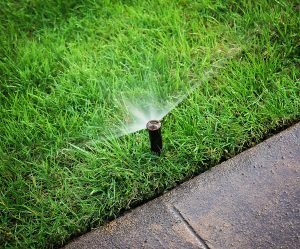 If you need your residential or commercial lawn irrigated, your sprinkler systems serviced, or one of your systems needs repair, look no further than Blooms Landcare. When watering your lawn with a drip irrigation system, it is important to recognize that systems need yearly maintenance at a minimum, even preferably twice a year when used heavily. Drip systems need to be thoroughly checked for broken and/or damaged components to ensure plants are getting all of their watering requirements met. You can see how important this would be in an environment like we have in North Texas. Blooms Landcare technicians are trained and are proficient in irrigation repair. Give us a call to speak to us about your drip irrigation systems repair needs. If you have an underground irrigation system in place on your Fort Worth property, it’s important to have the right company on your side when it comes time for repair work. Blooms Landcare is the irrigation repair experts. We know the ground conditions in the area, and our highly skilled employees take great pride in their work. We work around your schedule to ensure that you and your family don’t have to be greatly inconvenienced by the repair work. Are you looking for a trusted sprinkler repair company to service your Fort Worth home or business? Blooms Landcare has been proudly serving the Fort Worth area for years, and we know this area of repair better than most. Whether you’re having problems with the timer, the pipes are leaking, the sprinkler head is clogged, or some other issue, we’re the company to call. We provide the most professional service, quality, and expertise in Fort Worth sprinkler repair. Many homeowners today turn to advanced irrigation systems to bring new life to their gardens. If you’ve recently installed an irrigation system in your yard or garden, you’ll want to make sure it runs optimally for the foreseeable future. Any system will need repairs or modifications at some point in its life. By investing in professional repairs, you can solve any underlying issues before they can develop into something worse. At Blooms Landcare, we can handle any size or type of repairs. Our experienced, licensed technicians are always available to solve your irrigation troubles. We specialize in diagnosing and troubleshooting problems such as low pressure, leaks, valve malfunctions, poor coverage, or wiring issues. We use the latest tools and parts to perform both general maintenance and extensive repairs. A landscape irrigation system naturally uses quite a bit of water. However, if you notice your monthly utility bills rising, you might have an inefficient system on your hands. The costs of a failing or improperly installed system will far outweigh any benefits. The best way to avoid this is to invest in regular irrigation system maintenance. Maintaining an irrigation system is the most efficient method to reduce water waste, minimize pollution, and improve the overall health of your garden. At Bloom’s Landcare, we recommend scheduling professional maintenance for twice a year. During these visits, we’ll examine the controller, update the time, check all wiring, and replace the backup battery. We’ll also examine the system for leaks and damage. These leaks can occur due to weather damage, shovels, or animals. We find any problems and repair them promptly. Don’t hesitate to contact us today with any questions about irrigation repair. Blooms Landcare is here to help! Your irrigation system keeps your yard fresh and full of life. For the most part, homeowners operate their irrigation system during the spring and summer. It’s a good idea to check the entire system frequently during these peak watering seasons. If your irrigation system cannot provide adequate water, your garden may die off earlier in the year than it should. Over the winter, many people completely forget about their system. The extreme weather conditions could weaken the whole system and lead to leaks or low water pressure – both of which can harm your lawn. To avoid these issues, schedule a professional inspection once or twice a year, and make sure to check your system in the early spring. When you call for an inspection from Blooms Landcare, we will look for leaks, bent sprinkler heads, proper coverage, and any improvements that could be made to the system. How do I benefit from an in-ground sprinkler system? When you are considering an in-ground sprinkler system, you will balance the price with the benefits. There are many advantages to choosing an in-ground system compared to using just a typical hose and sprayer. An in-ground system will be much more efficient at watering your landscaping. This will save you considerable money over the course of the year on your water bill. Furthermore, an in-ground sprinkler system can be programmed to automatically turn on and off. No more forgetting to water your grass during the summer and ending up with dry patches! Overall, customers who install an in-ground sprinkler system have never been happier with their landscaping! Do you need help with your sprinkler system? Don’t wait; give us a call today.